My search for Tiger Beetles at Blue Jay Barrens has turned up a third species. 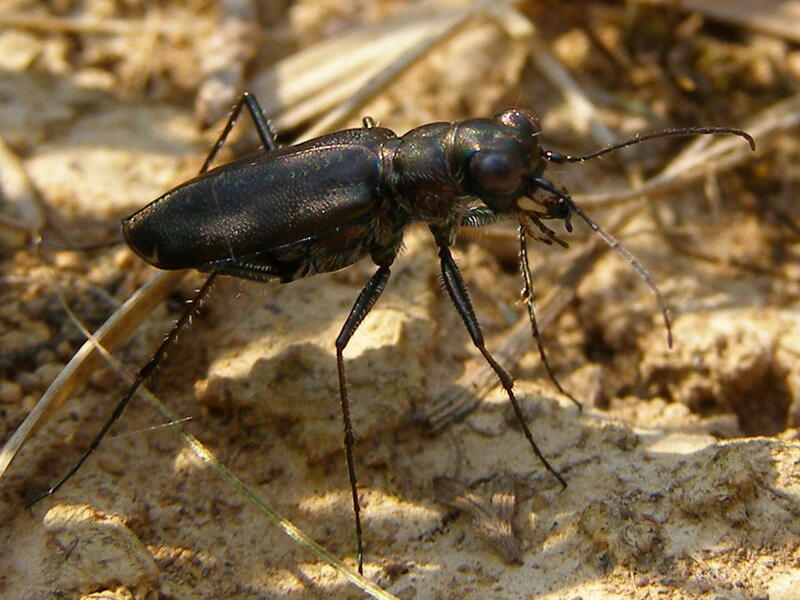 I discovered the Punctured Tiger Beetle, Cicindela punctulata, on the 4th of July. Although quite common in Ohio, this is a very attractive species. I’ve never before actively searched specifically for Tiger Beetles, so the joy of discovering the common species is mine to be had. 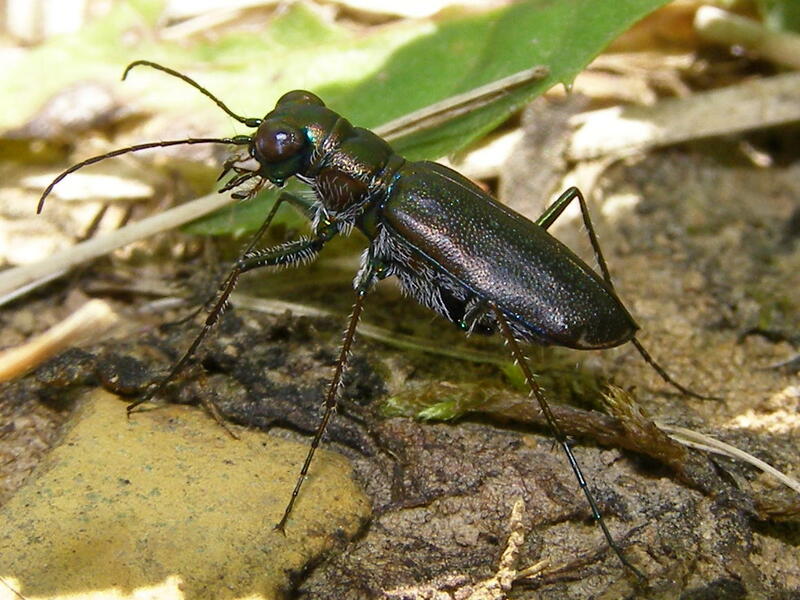 The Punctured Tiger Beetle gets its name from the row of green punctures running the length of each elytron. The elytrons are those hard coverings over the delicate flight wings. When a beetle flies, the elytrons are lifted and spread and then the flight wings unfold and go into action. 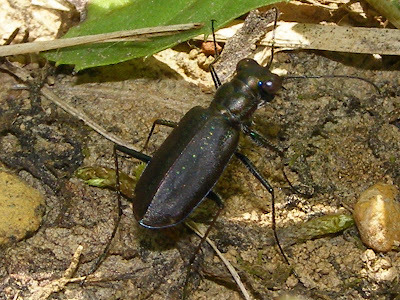 This is the only Tiger Beetle species in Ohio that has the green puncture markings, so it’s a pretty easy one to identify once you’ve seen it. The problem is in getting close enough to see any markings at all. From the perspective of a standing adult human, these are just tiny dark shapes on the ground that run at a rapid pace and fly away so quickly it’s sometimes hard so follow. Like most creatures of the insect world, you have to get close to appreciate the beauty of these animals. I found this species while walking the trail through the field. Many Tiger Beetles frequent trails and paths, because those areas invariably develop bare patches that resemble the beetle’s preferred habitat. These beetles spend their lives on the ground and need open, bare ground over which they can run in pursuit of prey or to interact with others of their species. Life on the barrens seems to suit them well. I’ve been watching for larva burrows any time I walk over bare ground. As I entered a clearing, I saw something pull back from the entrance to this burrow. This is how I’ve been expecting a Tiger Beetle larva to behave. 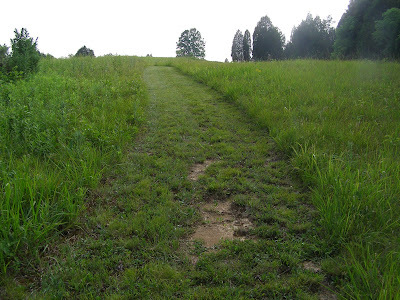 I got down and crawled over to a place that would allow me to see the larvae when it came back to the surface. The temperature was in the mid-90’s, but I was determined to out wait the occupant of the burrow. Finally, after about five minutes there was something moving in the burrow. I got the camera ready. Sweat burned my eyes and threatened to drench the camera, but still I waited. Then a head appeared and I quickly took several shots. After retreating to the shade of a tree and drying the sweat from my face, I viewed the shots of the larva. 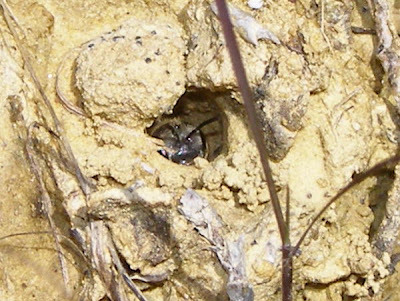 I thought it funny that I had just photographed the head of a bee that had been patiently waiting for me to go away so it could leave its nest burrow. Discovery of a larva will have to wait until another day. Hah! I can't tell you how many "larval" burrows I've staked out, only to see a bee emerge from it. With practice, one learns to recognize the characteristic beveling of the edge and very slight D-shape to the hole. I thought it was pretty funny. On knees and elbows during the hottest hour of the hottest day of the year to get a picture of a bee face. I did get a picture of a bee in a hole, which is something I didn't have before, so I did accomplish something. I'll keep trying. Both the beetle and the bee are fascinating. I've found only one tiger beetle on our place--and only in one summer. Saw it several days in a row and then it was gone. We always expect wasps to come out of holes in the ground, as there's a big red wasp, quite beautiful, that digs holes, drags a dead or paralyzed caterpillar into them, and then lays her eggs in the caterpillar and flies away. Hi, Elizabeth. We have a similar wasp here. It's a big red and black thing with long legs that straddle the caterpillar as its being drug. A very impressive creature. Common St. Johnswort - The Next Invader?